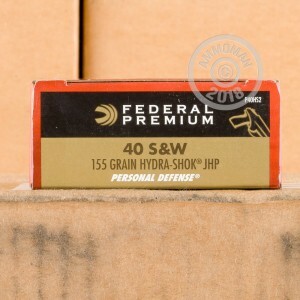 Federal Hydra-Shok is a top choice for personal defense and conceal carry. These 155 Grain Jacketed Hollow Points have a muzzle velocity of 982 feet per second and 352 ft lbs. of energy. 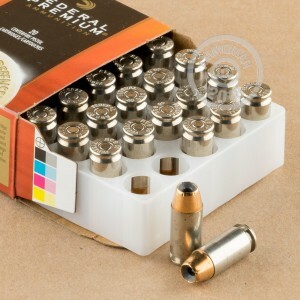 Federal uses boxer primed nickle plated brass casings that are re-loadable. This ammo has a center post design that allows the projectile to have controlled expansion. Federal ammunition is loaded in America at their Anoka, Minnesota facility. The entire Hydra-Shok line sets out to exceed market standards for premium self defense ammo. It's designed to deliver stopping power every time you pull the trigger. At AmmoMan.com all orders over $99 receive free shipping, so stock up for your next day at the range and save more!